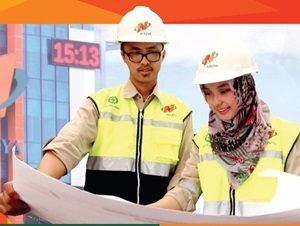 PT Nindya Karya (Persero) – Nindya Karya is a well-established state-owned general construction services company in Indonesia with rapid business expansion. Established since 1961, Nindya Karya has core business competencies in construction, Engineering, Procurement and Construction/EPC and investment. PT Nindya Karya (Persero) is a state-owned company which is majority owned by PT Perusahaan Pengelola Aset (Persero) or known by PT PPA Group. As of December 2017, PT PPA – a reputable state-owned financial and asset management firm in Indonesia fully-owned by the Government of Indonesia – holds 99% shares in Nindya Karya. Other 1% remaining shares was owned by the Government of Indonesia.